With an undying passion for creating and delivering soulful music, Patty Reese performs solo and duo acoustic and with her own band... The Patty Reese Band. From singing for more than 10 years almost nightly in bars and coffee houses to shaking the rafters of main stages on the east and west coast, Patty Reese has sustained a career doing what she does best... writing and performing the music she loves. Her style has been compared to Bonnie Raitt, Melissa Etheridge and Janis Joplin. Influenced early on by Etta James and Aretha Franklin, Reese has developed a style all her own including pop, blues, folk and rock. Patty has recently been performing as a duo with Jimmy Desanto, a guitarist with exceptional chops. At the time they met, Jimmy was painting houses full time, only playing out occasionally, until Patty discovered he had a giant catalogue of original material he had recorded in his basement. After collaborating on a few tunes, Patty hired DeSanto as her full time player. To complete the sound, Patty has recruited some of the area1s finest talent to perform on her CD and to assist her in rocking with passion and rolling full-throttle at her live, full band performances. After years of nominations, Reese took home the 2002 Best Rock Pop Vocalist award from the Washington Area Music Association (WAMA.) Since 1995, The Patty Reese Band was nominated consecutively by Music Monthly's reader1s poll as Best New Band and Patty as Best Female Vocalist. 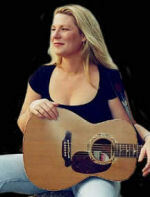 Most recently, her original song "Shotgun" won honors from the Northern California Songwriter's Association. Her rock anthem "Stuck on the Outside," a collaborative effort, placed in the top 10 in the TrueValue hardware national songwriting contest.